The F-series has been America’s best-selling truck for, roughly, forever, and has been in production for the better part of a century. But its not just the F-150. If you need a full-size pickup over 8500 GVWR, the F-series Super Duties set a high standard, with the Most Horsepower in its class, the Most Torque in its class, and the highest Maximum Towing in its class. The Ford Expedition has been a leader in the Full-Size SUV segment since it was introduced in the late 1990s. With its high towing capabilities and luxurious interior options, it’s the go-to option for shoppers needing an SUV with the best balance of power, comfort, spaciousness, and luxury. For the 2015 model year, in addition to upgrades like the refreshed exterior design and the addition of the 3.5L V6 EcoBoost to the lineup, Ford has added a new top-of-the-line package to the Expedition lineup: The 2015 Ford Expedition Platinum. The Expedition Platinum (which will also be available on Expedition EL), offers the great features you would expect from the Expedition, plus a new level of style and capability. Browse our inventory of New Ford Expeditions near Asheville NC. Great news out of the US News and World Report! In their annual ranking of “Best Cars for Families”, the 2014 Ford Fusion Hybrid was named “Best Hybrid Car for Families“! Anyone who has driven a Fusion Hybrid could probably have guessed this though – like with the rest of the Ford lineup, the Fusion Hybrid offers something for everyone. It’s got a spacious interior – perfect for hauling kids around. Its got a pretty sizeable trunk, especially compared to other mid-size sedans. It’s got plenty of advanced driver-assist and infotainment technology options like SYNC with MyFord Touch. It’s got an efficient hybrid powertrain that delivers all the power you need when you need it, without sacrificing fuel economy when you don’t (great for commuting to work, especially if your commute is a mix of city and highway driving). And at the end of the day, its just fun to drive. You don’t have to sacrifice the ‘fun’ factor just because you want to buy a hybrid. The “Best Cars for Families” award highlights cars, SUVs, and minivans that are the best fit for families. Award winners must have the best combination of high safety and reliability ratings, excellent reviews from automotive critics, and space and features that matter most to families. Browse our inventory of Ford Fusion Hybrids and Ford Fusion Energi Plug-in Hybrids at Ken Wilson Ford. The NHTSA just released the results of crash-testing the 2014 Ford Transit Connect… and the results look great! The 2015 Ford Fusion is going to have a great array of engines available, including efficient and powerful gasoline engines, and a hybrid and plug-in hybrid powertrain. This engine will be standard on the S and SE trim levels of the Fusion. It will produce 175 horsepower and 175 lb-ft of torque. The 2.5L iVCT I-4 has been around for years, and is a proven, reliable, and economical option. 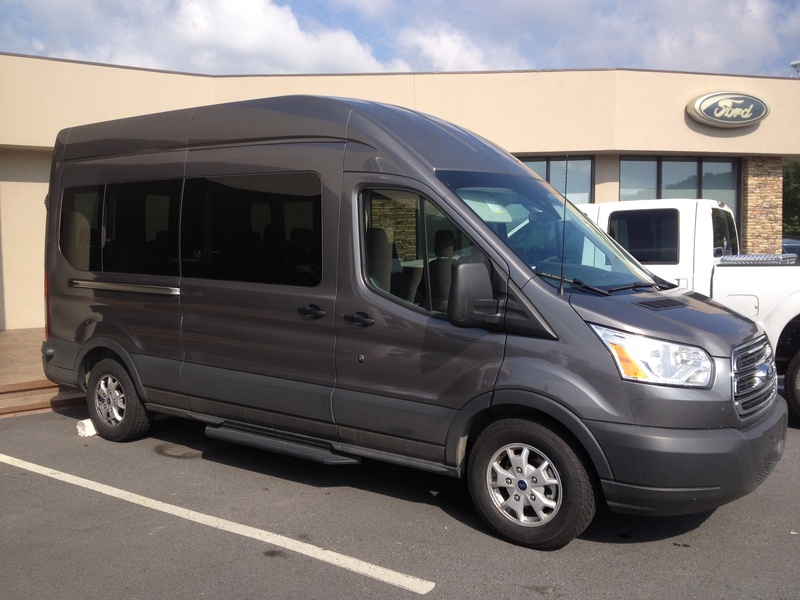 One of the trainers from Ford visited today to demo the new 2015 Transit for our sales staff. – The Transit is going to be built on F-series chassis, so our service technicians are already going to have years of experience working with the components of the Transit from day one. – The Transit comes in a 150, 250, and 350 model, and can be configured as either 8-passenger, 10-passenger, 12-passenger, or 15-passenger. You can also get it equipped as a cargo van. The 2015 Ford Fusion is going to feature a couple of small changes – nothing too drastic. 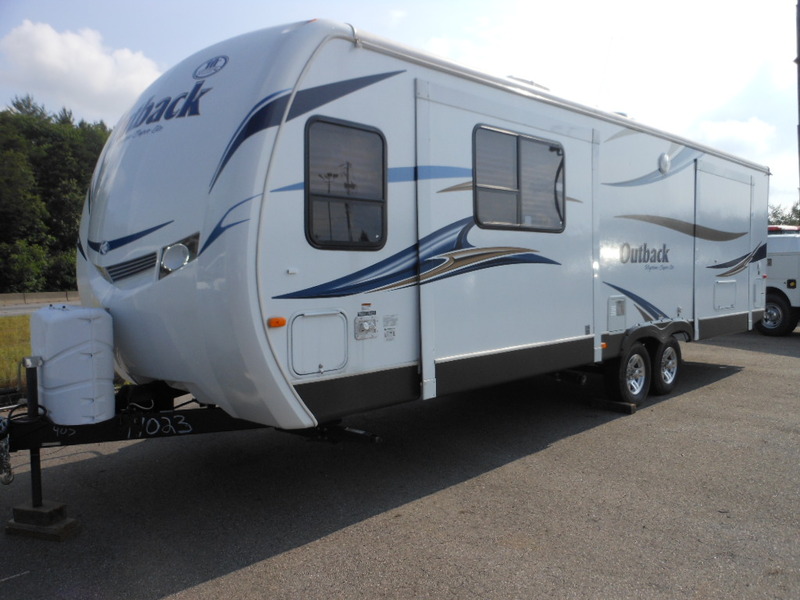 We’ve got sort of an unusual thing in stock (unusual for us, at least): a 2012 Keystone Outback Travel Trailer. We took it in as a local trade-in (Canton NC, if I’m correct, but it may have been somewhere else in Western North Carolina) a couple of weeks ago, and it’s in like new condition – the previous owner had only taken it on four trips (ever!). It’s got space for three flat-screen TVs with satellite hookups, including one outside, next to the propane grill/entertainment center/outdoor sink. This trailer comes with a queen size bed, as well as additional space for two other people. This would be a great trailer for grandparents who want to take the grandkids on vacation with them (just think how many favors the parents would owe you!) or for two couples who like to vacation together. This travel trailer is a bumper pull, so you won’t need a gooseneck or fifth wheel hitch – just a regular ol’ F-150 will be able to pull this trailer (Gross Vehicle Weight = 8200 Lbs). We’re asking $19,922 for it, which is a significant savings (over $4,000 off!) off of the suggested price of $23,995. We are partnering with Macaroni Kid of Waynesville to host a Back-to-School Supply Drive for needy families in our area! $10 off a Standard Oil Change! Ask for Eric, Frank or Heather from the Internet department, and they will give you the voucher.